Iain Ballantyne’s new book Hunter Killers is a true story of men, submarines, great nations and unforgiving seas. The impeccably-researched, swiftly-paced yarn follows a small band of Royal Navy submarine officers serving aboard a succession of increasingly sophisticated undersea vessels on the chilly front lines of the Cold War. At its core, Hunter Killers is mostly about just three men—attack submarine captains Rob Forsyth, Doug Littlejohns and Tim Hale—and a handful of boats including HMS Dreadnought, the Royal Navy’s first nuclear-powered sub, and HMS Swiftsure, lead vessel of what is arguably Britain’s most important class of Cold War warship. With Forsyth, Littlejohns, Hale and their submarines, Ballantyne explores the dangerous four decades following World War II, during which NATO and Soviet submarines, surface warships, patrol planes and frogmen pursued, harassed and spied on each other—frequently colliding or forcing each other into mishaps occasionally resulting in death or injury. In general, blurring the line between peacetime and war. Early in Hunter Killers, Ballantyne recounts the grisly fate of Lionel Crabb, a “well-known veteran of daring underwater exploits during the Second World War.” In 1956, British intelligence dispatched Crabb to Portsmouth in southern England—a Royal Navy submarine base—to secretly inspect the underside of the visiting Soviet cruiser Ordzhonikidze. Crabb never returned. A year later a headless corpse washed up. It seemed Crabb had either been sucked into the cruiser’s propellers … or had been killed by Soviet naval guards. “Did any submariner need to be reminded the Cold War could be fatal?” Ballantyne muses. In the 350 pages following the Crabb story, Ballantyne—editor of Warships International Fleet Review magazine and an occasional War is Boring contributor—packs scores of surprising, sad and sometimes hilarious episodes, each a single note in the drumbeat of Cold War espionage, arms development and naval maneuvers. During the Cuban Missile Crisis in October 1962—arguably the most dangerous 13 days of the 20th century—the Royal Navy seconded British subs to the Canadian navy, and the Canadians sent the boats to help the Americans blockade Cuba against shipments of Soviet nuclear weapons. 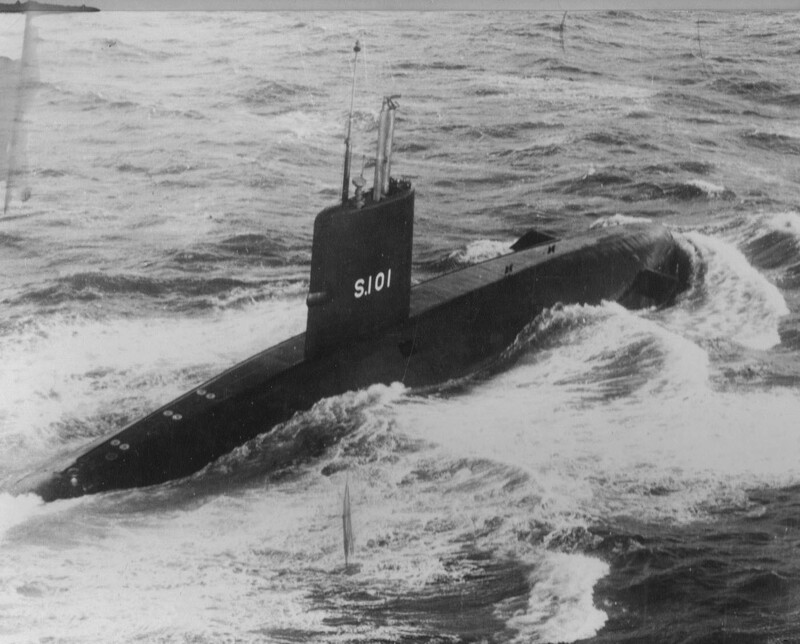 While serving on the World War II-vintage diesel submarine HMS Auriga in Canada in 1963, Forsyth helped test a novel method of harassing Soviet subs and making them easier to detect. “A Canadian boffin had come up with the idea of dropping dozens of ‘floppy magnets,’ which it was hoped would create a noise nuisance, clinging to the target boat’s hull and flopping around,” Ballanytne writes. But according to Ballantyne, the magnets and other far-fetched tactics reflected NATO’s desperation as it struggled to keep up with Soviet naval deployments. At the height of the Cold War in the 1960s, Moscow possessed hundreds of submarines—far more than NATO could muster and enough to devastate NATO shipping in the event of full-scale war. Increasingly, subs also carried nuclear-tipped ballistic missiles. The rockets on the Soviets’ missiles boats lacked range compared to American munitions. “With their less capable boats and missiles, the Soviets sought to use ice cover to gain advantage by getting closer to their targets in the USA.” That meant sending submarines under the Arctic ice cap. To hunt down the missile boats, NATO needed submarines of its own capable of operating under the deadly, shifting floes. Diesel boats needed regular access to fresh air for their engines and risked getting trapped under solid expanses of ice. “There is surely no more dangerous an environment in which to operate diesel-electric submarines than under ice,” Ballantyne explains. Nuclear propulsion was the answer. A nuke boat—“SSN” in naval parlance—doesn’t need to snort air for its engines and can stay under the floes until its crew runs out of food. In 1963, the Royal Navy commissioned Dreadnought, pictured, its first nuclear-powered submarine. Assigned to the vessel as torpedo officer, Hale marveled at the limitless supply of fresh water from the reactor—meaning he and his crewmates could shower whenever they wanted. Water supplies were limited on diesel boats, resulting in the vessels’ signature odor of steadily filthier bodies. But for all her sophistication, Dreadnought still carried Mark 8 torpedoes dating back to 1929. The Royal Navy struggled for many decades to produce a modern, reliable torpedo to arm its cutting-edge submarines. Nineteen years later during Britain’s brief war with Argentina over the Falkland Islands, the nuclear attack boat HMS Conqueror fired a spread of the ancient Mark 8s to sink the Argentine cruiser Belgrano, killing 321 men and frightening the Argentine fleet back into port. “The power and utility of the SSN in a hot war had been proved,” Ballantyne writes. But the Cold War still dominated undersea planning and operations. In 1971, Hale took command of Swiftsure while the vessel was still fitting out. For more than 30 years, Swiftsure and her five sister vessels were among the deadliest submarines in all the world, representing “a major increase in size, endurance and capabilities,” Hale told Ballantyne. Dogging Soviet vessels and snooping on Moscow’s communications, the Swiftsures would help bring the Cold War to a mostly bloodless end in the early 1990s. But there were plenty of frightening near-misses in the meantime. All three of Ballanytne’s main protagonists commanded Swiftsure-class submarines. Forsyth skippered HMS Sceptre. Littlejohns also commanded Sceptre—starting in 1981, shortly after the vessel collided with a Soviet missile submarine she was tailing in Arctic waters, resulting in a “terrifying level of damage” that nearly sank the boat, according to Ballantyne. The Swiftsures began to decommission in 1992. Sceptre was last, bowing out in 2010 as the Royal Navy’s SSN force winnowed to an eventual total of just seven new Astute-class vessels. Forsyth and Littlejohns were at the Devonport submarine base to commemorate Sceptre’s decommissioning. “It is to these men, in peace or war, to whom we owe so much,” said Steve Waller, Sceptre’s final skipper, referring to the assembled veteran submariners. “Amen to that,” Ballantyne writes.